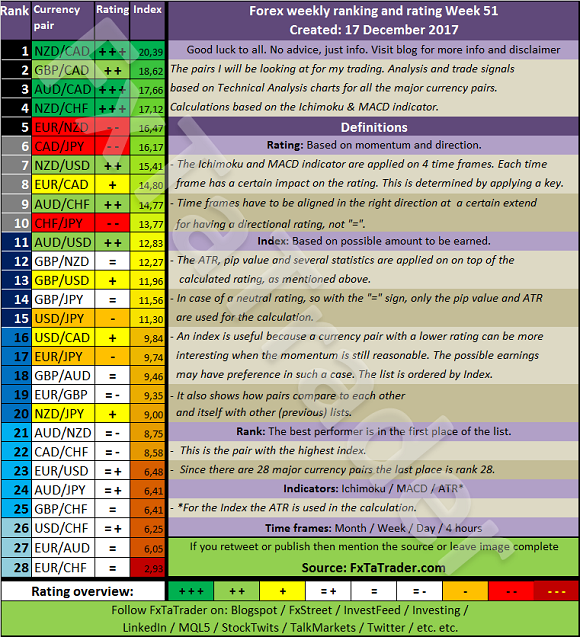 The Top 10 of the Ranking and Rating list for the coming week shows the following stronger currencies being well represented for going long: the NZD(4X) followed by the AUD(2X) and the JPY(2X). The weaker currencies are the CAD(5X) followed by the CHF(3X). Strong: EUR, USD, GBP and CAD. The preferred range is from 5 to 8. Neutral: JPY, AUD and CHF. The preferred range is 2 to 4. Weak: NZD. The preferred range is from 1 to 1. With the FxTaTrader Strategy, these pairs are not traded because these would be trades in lower Time Frames than the 4 Hour chart. Nevertheless, they may offer good chances for the short term trader. The Chart for this week is the CAD/JPY 8 Hour chart and the set-up is a Short Entry. Price is clearly in a downtrend and is now gaining momentum and going towards the latest bottom at 86,75 . A nice sell opportunity would be around the current level and on possible pullback around the Nr. 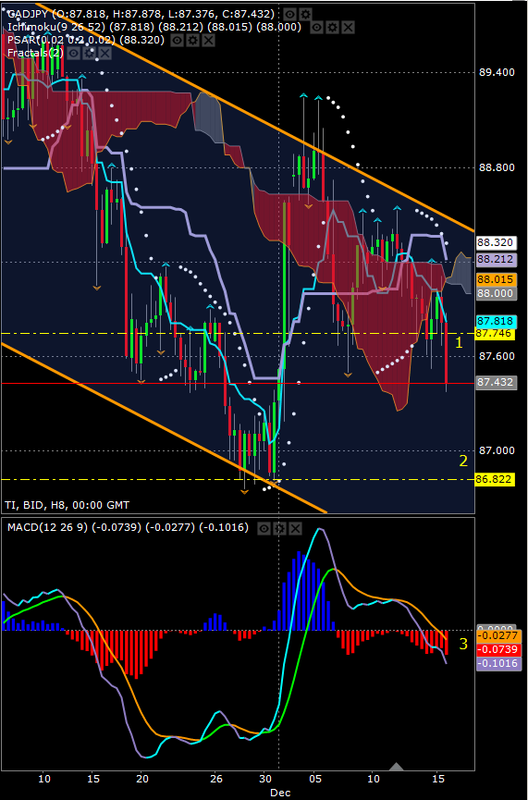 1 yellow dotted line and the Tenkan-Sen. The yellow dotted line seems to be an important Support/Resistance level. Price should be gaining momentum at the mentioned levels after the possible pullback. Entering at the current level seems a good idea too because it made a pullback already with a recent high of 14 Dec. and there is momentum already. Another pullback may not take place again. The PSAR is positive for entering short trades in the 8H. and Daily chart. Even if it turns negative in the 8H. chart it is in favor of short positions. As it seems for now, it will not turn negative. By preference, the candlesticks should show a good pattern that confirms the entry. This could be e.g. one of the reversal Candlesticks patterns or a continuation pattern. Check e.g. the following links for more information: Bulkowski's Top 10 Reversal Candlesticks , Wikipedia Candlestick pattern or Investopedia Candlestick . The target should be, depending on the current set-up going long or short, below/above the Nr. 2 yellow dotted line where the latest high/low was made. This may be or become a resistance/support level and closing below/above that level is for that reason a good target. In case of a stronger pullback with price going far below/above the Nr. 1 yellow dotted support line with the MACD not recovering the set-up is no more valid. A stop-loss should be placed below/above a recent top/bottom. These are levels where Resistance or Support may reside too. The MACD should show in the right direction strength in the MACD minus Signal, these are the Blue and Red bars. In case of an uptrend, the red bars should become smaller or the blue bars larger. In case of a downtrend, the red bars should become larger or the blue bars smaller. The MACD should stay above/below the zero line. This is a pair that fits best in Point 2 of the Comparison Table Guide. 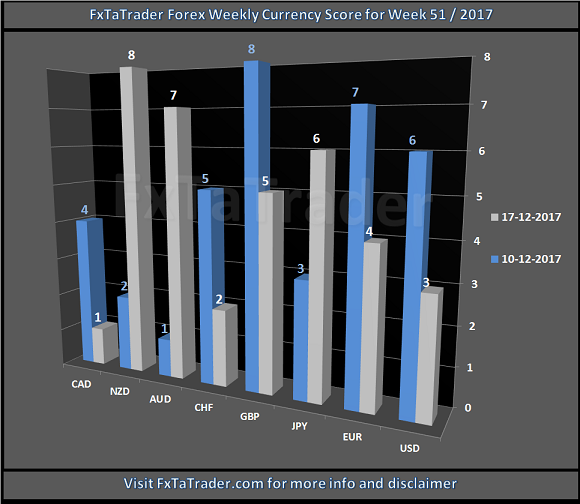 For more information read my other Weekly article called the "Forex Strength and Comparison" and the pages Explanation Articles. The JPY is a Neutral currency and the CAD a Strong currency. The Currency Score Difference is 5.